Our little doodle family is officially moved in! It is hard to believe but after weeks of packing, painting, and about eight solid hours of moving on Saturday, we are here. The house is beginning to come together, especially now that our furniture has arrived, but we still have a laundry list of items to tackle - paint three more rooms, fix the fence and gate, paint the trim outside (not in the too near future! ), and so on and so forth. Regardless, it feels very good to be "home" for the Christmas season. 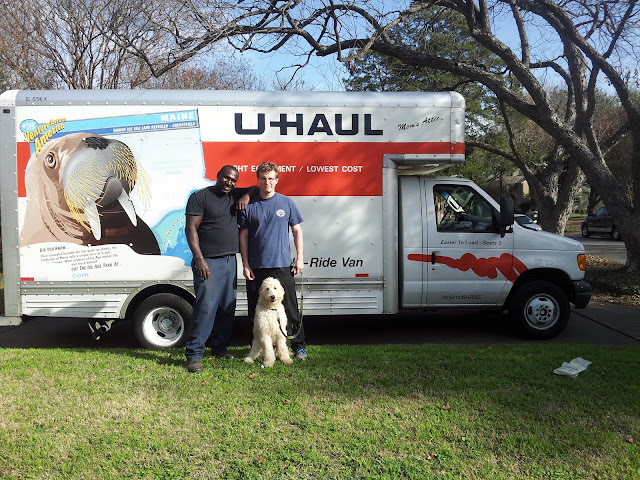 I know what you are all thinking... Did Milton get to ride in the 17-ft. U-Haul? Sadly, no. We opted not to buy the insurance, and Milt can be a bit distracting on the road at times, so he only got to watch the hours of packing and unpacking. That was not quite as much fun but still provided some amount of viewing pleasure! Welcome home, Milt. Goodbye 2012 AND Hello 2013! A Gingerbread House for Christmas! The Deed is Done... Finally!